Prep Time: 20 min. | Cook Time: 5 min. 1. In a large bowl, whisk mayonnaise, lime juice and zest, Serrano, chili powder and ½ teaspoon salt. 2. Preheat outdoor grill or indoor grill pan over medium-high heat. Brush corn with vegetable oil and season with salt and pepper. 3. Grill corn, turning occasionally to char all sides, 5 to 6 minutes. 4. Remove from grill and using chef’s knife, cut corn from cob into large bowl containing dressing. 5. Fold in bell pepper and diced mango; top with mango, cheese and cilantro. 6. 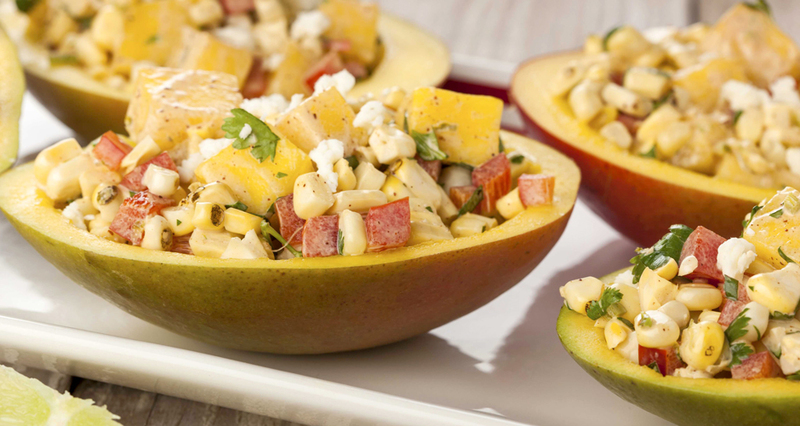 Serve at room temperature or chilled in individual mango cheek bowls.